Discover your new go-to dessert with our Dark Chocolate Ganache Cheesecake! 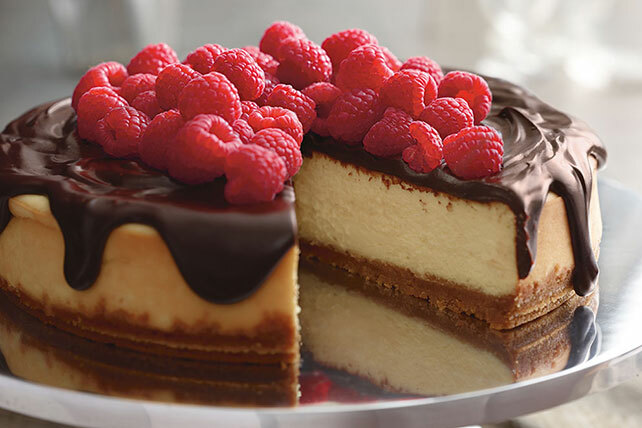 Top your chocolate ganache cheesecake with raspberries for a gorgeous treat. Mix graham crumbs, 3 Tbsp. sugar and butter; press onto bottom of 9-inch springform pan. Microwave COOL WHIP and chocolate in microwaveable bowl on HIGH 2 to 2-1/2 min. or until chocolate is completely melted and mixture is well blended, stirring after each minute. Cool 15 min. ; slowly pour over cheesecake. Garnish with raspberries.